The Supper Quilt - by Donald E. Locke D.D.S. A Quilt Of The Last Supper. This interpretation contains 51816 squares, each is a 1/2 inch square. The quilt is 67 inches high and 183 inches wide. Churches, shops and quilt shows are encouraged to book a presentation or display. The Supper was inspired by Leonardo daVinci's "The Last Supper" painted 500 years ago on the wall of a Dominican Cloister in Milan, Italy. An example of some of the pictures that await. 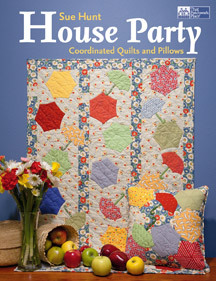 I would like to introduce you to my daughter's new quilt book "House Party, Coordinated Quilts and Pillows". Here's a brief description (pdf). And to order from the publisher, Martingale & Company ., And available from Amazon. 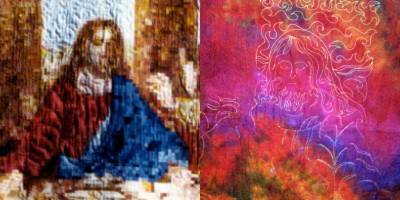 Some Videos of Don discussing different aspects of the Supper Quilt. For a full listing, go to YouTube and search for "Supper Quilt". We estimate that over 850,000 people have viewed The Supper Quilt. We would like to visit every state, but we are short 12. Please help us out.